Back in the 80s, American cartoons—especially Saturday morning cartoons—were basically just thirty-minute ad spots for various toy lines by Hasbro, Kenner, et al. Transformers, G.I. Joe, He-Man—all broadcast to sell little plastic mans to kids. Kids just like me. Hell, there was even a Rubik's Cube cartoon on Saturday Mornings! One of my favorites to come out of that mess of sketchy animation and questionable writing was M.A.S.K. Since I'm not here to write a 1,000 word article about M.A.S.K., I'll just give you the TL;DR. M.A.S.K., which stands for Mobile Armored Strike Kommand (just work with me here) was a line of Kenner toys that featured various vehicles that turned into other kinds of vehicles—a Camaro that grew wings, a '57 Bel Aire that turned into an infantry fighting vehicle, a Jeep that turned into a boat, etc. These vehicles were piloted by a crack force of highly trained drivers pulled from all walks of life (similar to how G.I. Joe worked) who each wore a special, high-tech helmet that possessed special powers like hologram projection or laser eyes. In the cartoon, M.A.S.K was a secret, disavowable, anti-terrorist and crime-fighting team that fought against the evil V.E.N.O.M (Vicious Evil Network of Mayhem. Again, work with me here) who had their own convertible vehicles and high-tech helmets. It was kind of a mash-up of G.I. Joe and the A-Team, and it was awesome. 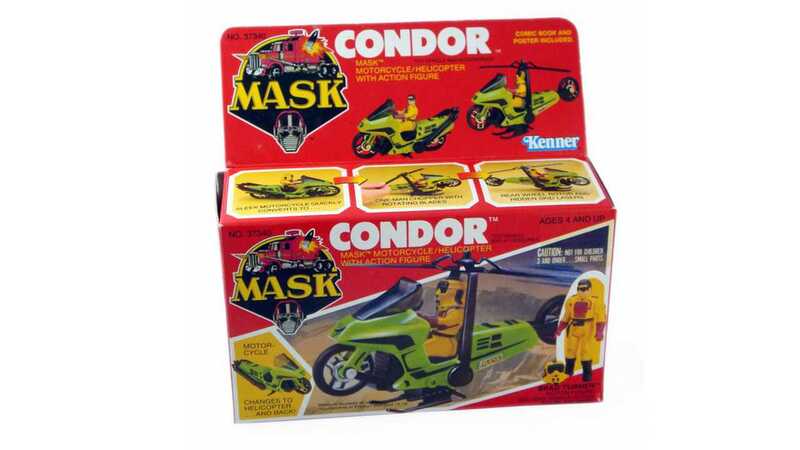 Out of all the M.A.S.K vehicles, my favorite was the Condor. Condor is, supposedly, a sportbike that transforms into a gyrocopter. It's equipped with a pair of retractable laser cannons mounted to the helicopter skids, an "anti-matter" beam that lets it pass through solid objects, and something called a "laser-guided mach" system that allows it to travel safely, on the ground, at the speed of sound. Pretty ace, right? 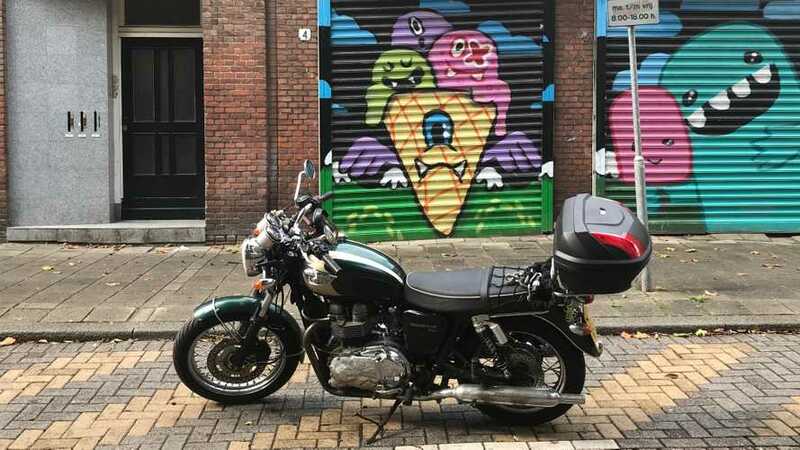 There's no information on what kind of bike Condor started out as (and let's ignore the fact that it looks more like a step-through than an actual motorcycle, shall we? I assume that's due to production limitations. Or the fact that the person who designed it had never actually seen a motorcycle), but looking at it we can make some pretty strong guesses. To start with, look at that color. That is clearly Kawasaki racing green, so chances are that Condor is one of Team Green's early-80s sportbikes. It's fast, and it needs enough power to drive both the rear wheel and the chopper blades, so it has to be one of the larger displacement bikes in the lineup. I'm going to guess that Condor is a heavily modified GPZ1100, because why not? Whatever it is or isn't—and honestly it's just a "motorcycle" but I love stupid cartoon exercises—it's extremely rad and I wish my Yamaha could grow wings and fly whenever I'm stuck in Detroit traffic. Below I've included the M.A.S.K. opening credits, which are amazing. Look for Condor in action toward the very end of the video, it's worth the wait. Bubblegum Crisis is one of my favorite anime series, and one of my favorite pieces of cyberpunk media – second only to William Gibson's Sprawl Trilogy. 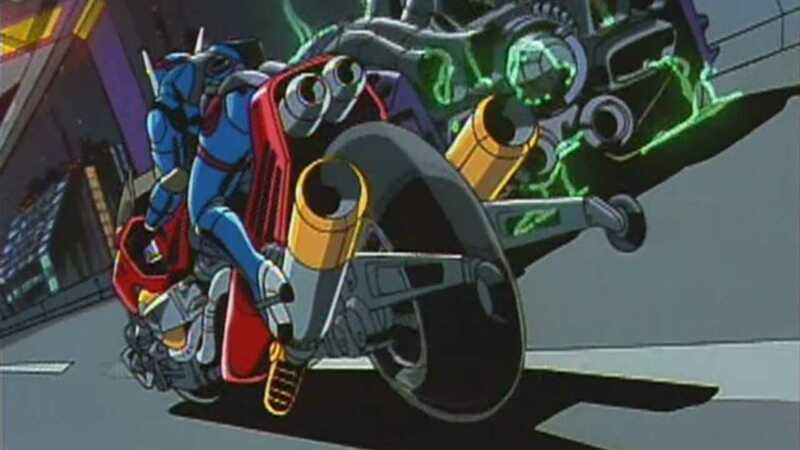 It also has some of the raddest bike action this side of Lupin III. The series takes place in future MegaTokyo and revolves around the Knight Sabers, four mysterious vigilantes in powered suits who fight a rising tide of advanced, nearly unkillable androids called Boomers. The Knight Sabers are all women and come from all walks of life. Sylia, the team leader and the designer of the powered suits, owns a string of high-end lingerie boutiques. Linna is an aerobics instructor (which, more than anything else dates this series to the late-80s/early-90s). Nene is a police dispatcher, a hacker, and an electronic warfare ace. Last but not least, Priss is a rock singer with her band The Replicants and a motorcycle street racer. That's pretty much what you need to know right now—four women in powered armor riding motorcycles and fighting unstoppable robots. In episode 4, an old-timey, Lamborghini-style supercar is prowling the streets of MegaTokyo killing bikers. After Priss gets into a race with it one night, which she loses because her bike blows up and wipes out on the freeway, the Knight Sabers decide to have a crack at stopping it. The ghost car is crazy fast though, so the Sabers turn to Mackie, Sylia's little brother and a mechanical genius, for the one vehicle that can catch it—the Highway Star. Highway Star is a weird, Frankenstein parts bike Mackie built out of junk pulled from a scrapyard and it's insane. Long and low, it's powered by a twin-turbo, 1500cc mill that puts down 700 horsepower through a shaft final drive. 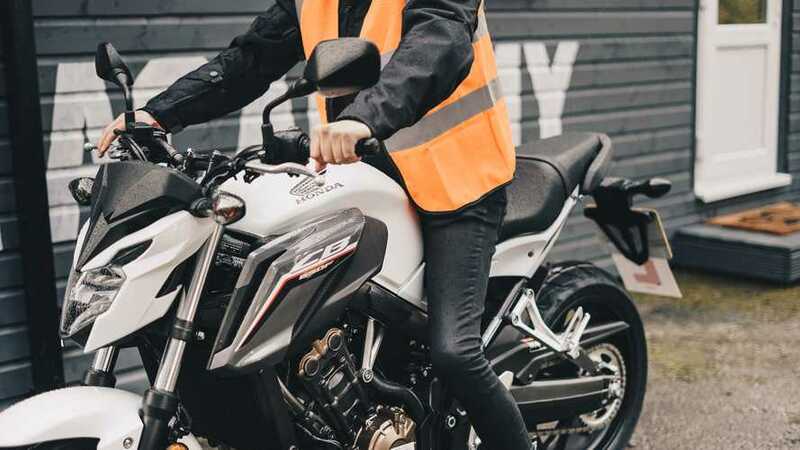 It's got all the dark-future cyberpunk fittings like digital gauges from a scrapped military vehicle, weird pistol-grip controls in place of handlebars, and a crazy futuristic front suspension setup that's basically just a front swingarm like on a Vyrus or a Bimota Tesi 3D. It's so fast and ridiculous and powerful in fact, that it can't be ridden unless the rider is wearing a powered suit. Good thing for our heroes that they have some. Eventually, at the end of the episode, Priss chases down the ghost car with the Highway Star but ends up destroying it in the process. There's a happy enough ending, and the last scene is Priss sitting in a garage with the Highway Star's wreckage trying to put it back together as punishment for wrecking it. I threw a short video in below showing some of the best bike action from the episode and an extremely 80s J-pop song. If you're interested, you can find the entire episode here in Japanese with English subs. I highly recommend you watch the whole series though because it's really great. 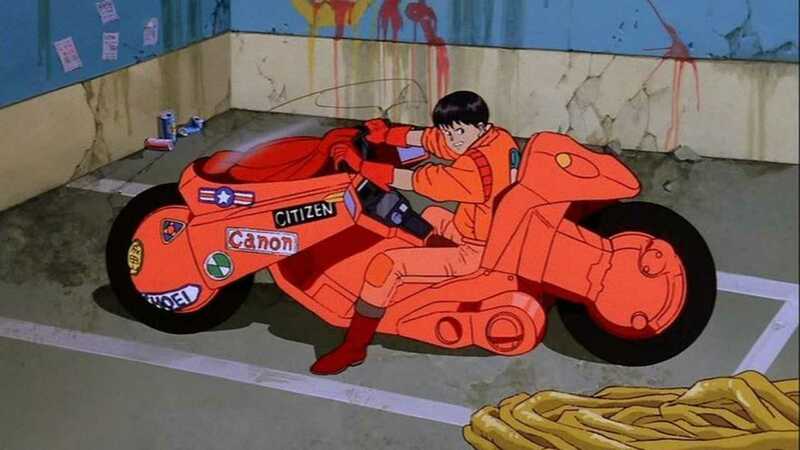 Yet another iconic anime bike, Kaneda's bike is probably the least surprising entry on this list. For those of you who don't know, Akira is a ground-breaking feature-length anime that came out in 1988. 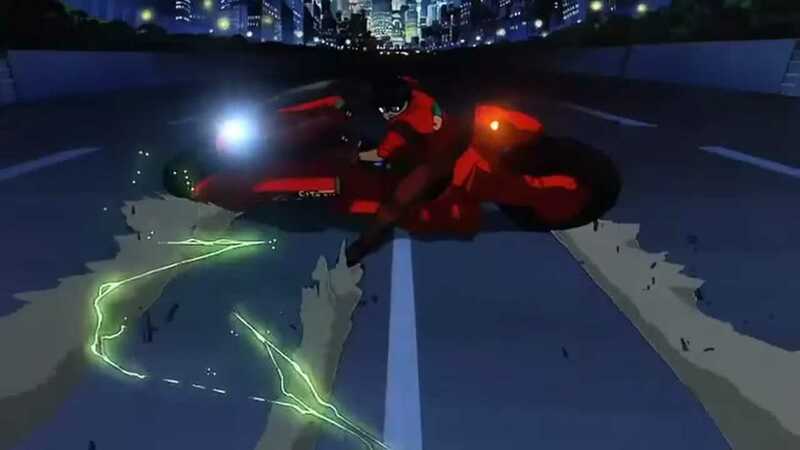 Based on a manga series of the same name, Akira takes place in a futuristic, post-apocalyptic Tokyo after an Earth-shattering psychic phenomenon triggered world war III. Our hero, so to speak, is Kaneda, a young motorcycle hoodlum who runs a bosozoku gang with his bestie Tetsuo. All these dudes and their buddies want to do is to ride their weird futuristic motorcycles around, battle other gangs, and generally have a good time. Unfortunately for them, life has a different plan for them. Over the course of the film, the two bosozoku get wrapped up in a whole raft of conspiracies involving top secret research into psychic "espers", a government coup, and even the construction of a stadium for the upcoming Olympic Games of all things. The film is incredibly bloody, a little slow-paced in places, the last quarter of the story is suuuuuuuuper trippy, and you should go watch it right this instant because it's really good. As for the bike, man, it's pretty weird. A lot of the bikes shown in the film are pretty recognizable as generic Japanese motorcycles and stand in pretty well for the Big Four, but Kaneda's ride is something else entirely. 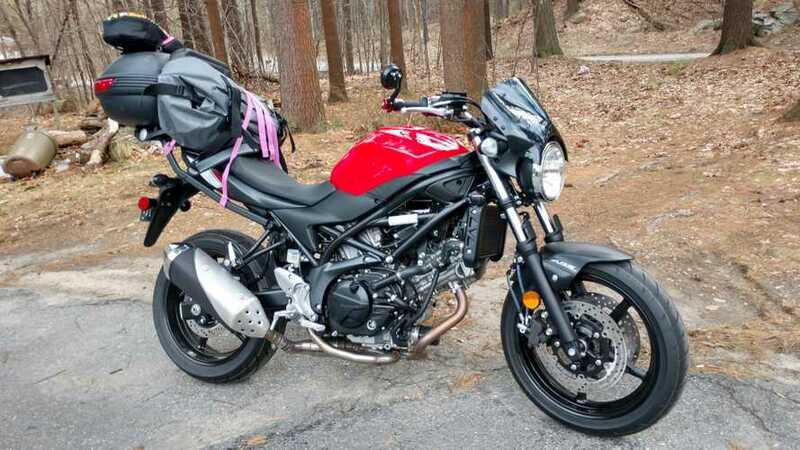 It's less a motorcycle and more like a recumbent bicycle and a Suzuki Burgman had a baby and that baby grew up and fell into a life of crime. 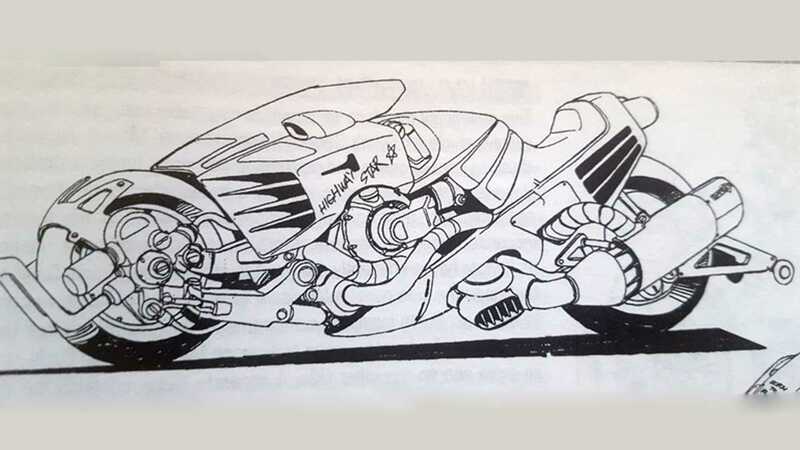 Like the Highway Star, it has swingarms at both ends (Japanese animators had a thing for front swingarms in the 80s), and its controls are a combination of bike, scooter, and car bits. The transmission and final drive are a mystery, but in the movie, it has a reverse gear and features something called "ceramic double-rotor two-wheel disk drive" which is some serious Geordi LaForge-level technobabble. My biggest gripe with the design is that you don't really sit on Kaneda's bike so much as you sit in it. The weird recumbent seat combined with a stretched-out chopper like riding posture looks really awkward and uncomfortable, but it doesn't seem to phase Kaneda. Honestly, it looks like it sits a lot like Condor from M.A.S.K., with the rider's feet inside the fairing on pegs or floorboards. 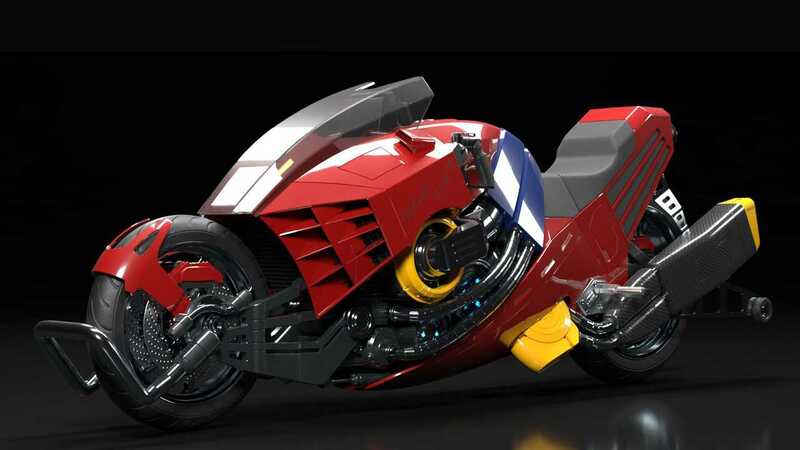 Whatever Kaneda's bike is—there's some speculation among anime nerds that it might be a BMW race bike due to a familiar-looking roundel on the bike's fairing in some shots—it's definitely cool, but I don't think I'd have one in my garage. It's just a little too un-motorcycle-y for me. Now this, this, is my favorite bike on this list. 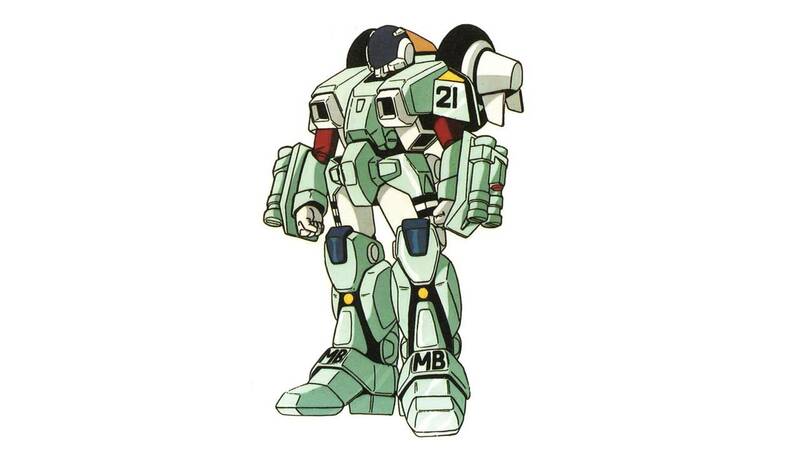 Friends, let me introduce you to the MOSPEADA Ride Armor from Genesis Climber MOSPEADA. GCM is a 25-episode anime series that ran from 1983 to 1984. It followed a band of young freedom fighters traveling through North and South America on their way to destroy Reflex Point, the base of a group of aliens that had invaded Earth and largely destroyed it. A few years after its debut, MOSPEADA was combined with two other famous anime series – Super Dimensional Fortress Macross and Super Dimensional Cavalry Southern Cross (no relation) – to create the American cartoon Robotech. 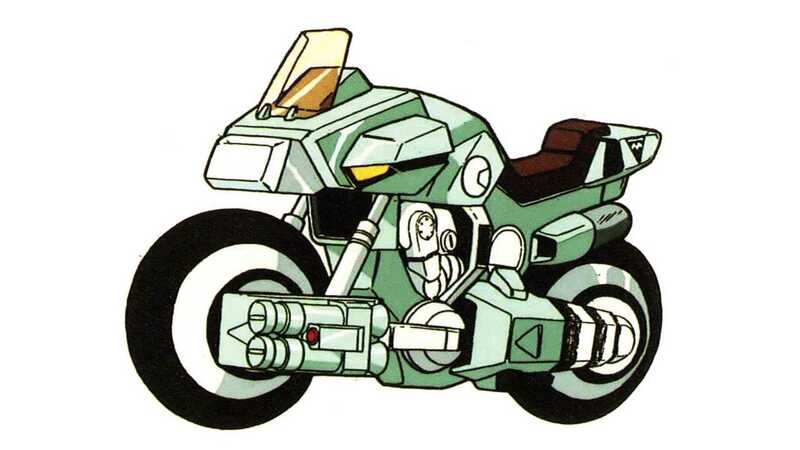 Any of you who recognize this bike probably know it as the Cyclone from Robotech. Note: From here on out, even though I'm talking about MOSPEADA, I'm going to call this thing the Cyclone because I love that name. Is the SilentHawk SOCOM's New Whip? 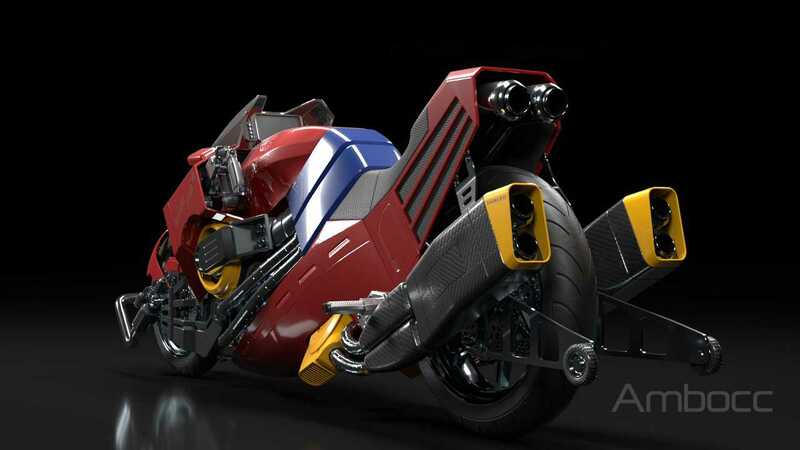 In both shows, the Cyclone is a high-tech military bike that transforms from a dual-sport/adventure-style bike to a suit of power armor. There are a few different versions—a light scout bike, a stealth/infiltration bike, a heavy assault bike, etc.—but they all share a lot of systems in common. Powered by a compressed hydrogen fuel called HBT (or by Protoculture in Robotech), these bikes are fast, agile, tough, and equally at home on road and off. They can be fitted with hard panniers and a locking trunk, along with a bunch of different weapons like missile launchers, laser cannons, mass drivers, etc. They're sort of a Swiss Army vehicle in the cartoons – they can do a little of everything and are crazy useful to have around. In armor mode, the Cyclone grants the rider/wearer increased strength and speed along with limited flight capabilities and an array of advanced sensors and optical enhancements like thermal imaging, night vision, targeting computers, etc. 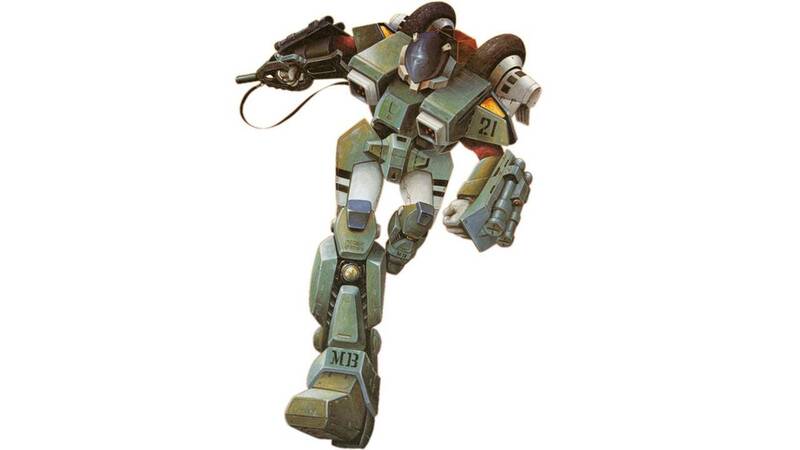 It's designed to allow the rider to act as a one-person mechanized infantry squad, and to go toe to toe with the show's antagonists, the inscrutable Inbit. The Cyclone was designed for MOSPEADA by a mechanical designer named Shinji Aramaki, who had worked on the Diaclone toy line that would eventually become the Transformers we know and love. He once said that the idea for the Cyclones came to him while out riding his Honda when he got to thinking that the little bike was just the right size for a person to wear. The general design of the Cyclone is said to have been heavily inspired by the first generation Katanas, and you can definitely see a little of the old GSX1100 in the Cyclone's general stance and the lines of its front end. Of all the bikes on this list, the Cyclone is the one I'd most want to have. I've been obsessed with Robotech since I was just a little nerd, and I even worked professionally with the Robotech IP when I helped bring the new Robotech role-playing game back to market in the late-aughts. Along with being near and dear to my heart as part of a series I grew up with, the Cyclone just ticks all my boxes—it's fast, it has two wheels, it changes into a suit of heavily armed power armor. It's basically my dream bike. Back in 1986—before anyone had even heard of Michael Bay—Transformers the Movie hit American theaters and it was the biggest, greatest joke ever played on the American moviegoing public. Millions of nerdy kids, including yours truly, pestered their parents for months leading up to the premier to take them to the theater. We all filed in expecting 90-minutes of the usual fun, light-hearted, mildly corny weekday afternoon claptrap with a side order of the old hard sell for some new toys. What we got was the graphic deaths of many of our cartoon heroes, a totally weird but extremely rad hair metal soundtrack, a completely bored and checked out Orson Welles doing one of the most chilling bad guys in cartoon history completely by accident, blatant stunt casting (I'm looking at you, Leonard Nimoy) and some surprisingly good visuals. It wasn't all doom and gloom though. For all the death and destruction we got a ton of new characters like my man Springer, the galaxy's saltiest sergeant Kup, supremely annoying Blur (voiced by also supremely annoying John Moschitta) the arguable hero of the whole movie Arcee, and best of all, Wreck-Gar. Wreck-Gar? Oh yeah man, Wreck-Gar. See, at one point in the movie our heroes end up on the Planet of Junk, a big old planet-sized junkyard (god I love a space junkyard) and run into the seemingly hostile Junkions. The Junkions are some flavor of non-aligned mechanoid species descended from Cybertronians who are pretty much built from bits and pieces of cast-off machines. To a man – or, uh, to a robot I guess – their alt-modes are futuristic Mad Max-style motorcycles. The Junkions are led by Wreck-Gar, a bright, aggressive, technically adept nutjob voiced here by Eric Idle. Yes, that Eric Idle. Remember what I said about stunt casting? Anyway, after some initial hostilities, the Autobots gain the trust and affection of the Junkions via the Universal Greeting and a bit of TV-talk from Sgt. Kup. 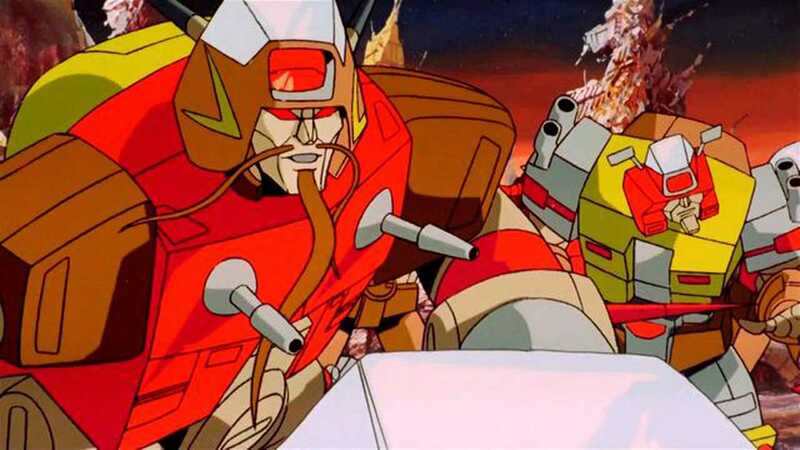 With their new friends, who are essentially horse-mounted Mongols in robot form, our heroes rebuild their friend Ultra Magnus—voiced by the Robert Stack—who was destroyed in the previous scene and go on to win the day. It's ridiculous, I know, but it's also very, very awesome. See, I love a mechanic character, and a mechanic character who is also a robot that transforms into a motorcycle is directly in my wheelhouse. I've included the entire scene below if you haven't seen it. It features some great action and a soundtrack by none other than Weird Al Yankovic. Also, if you haven't seen Transformers the Movie, go do it right now. It's...man...it's something else. So, yeah. Tron isn't technically a cartoon, but most of it is heavily computer animated so I'm going to give it a pass here. 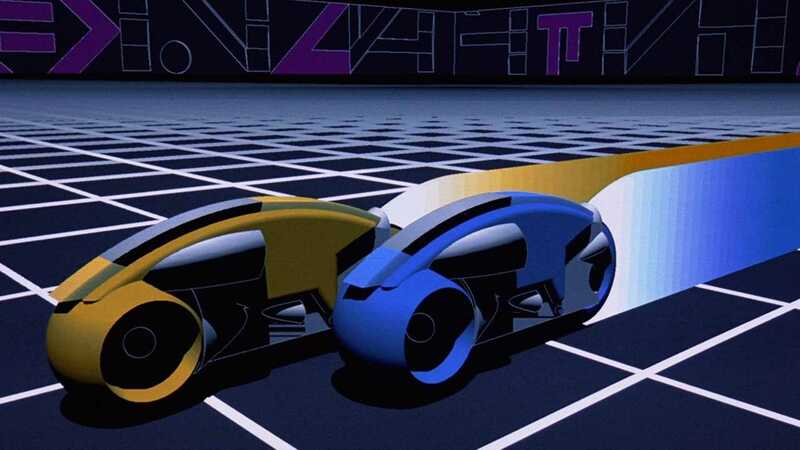 As you may remember, Tron is one of those early-80s movies, like The Black Cauldron and The Black Hole, that Disney made during their post-Walt attempt at being all grim and dark and adult. Unlike Black Cauldron and Black Hole though, Tron is actually good and, thirty-some years later, is considered both groundbreaking and a cast-iron classic. In the movie, The Dude plays a computer programmer who gets sucked into a video game of his own design and has to fight his way through a weird computer landscape while being terrorized by Sark and the Master Control Program. In one of the film's most famous scenes, Bridges' character is forced into a deadly game of Lightcycle in an effort to get rid of him. Unfortunately for the bad guys, our hero wrote the code for Lightcycle and uses an exploit to escape from certain death with his friends. The Light Cycles themselves are super awesome. They're low-slung, fully-enclosed sportbike-like things that go a million miles an hour and leave behind a solid trail called a "jet wall". The whole point of the game is to lure your opponents into crashing into your jet wall while you avoid their jet wall. It's tougher than it sounds. They also make this amazing noise that, hopefully, will be the new "Loud Pipes Save Lives" when electric motorcycles eventually take over. I've included a clip from Tron showing the woefully short light cycle sequence below, but you should really go see Tron. 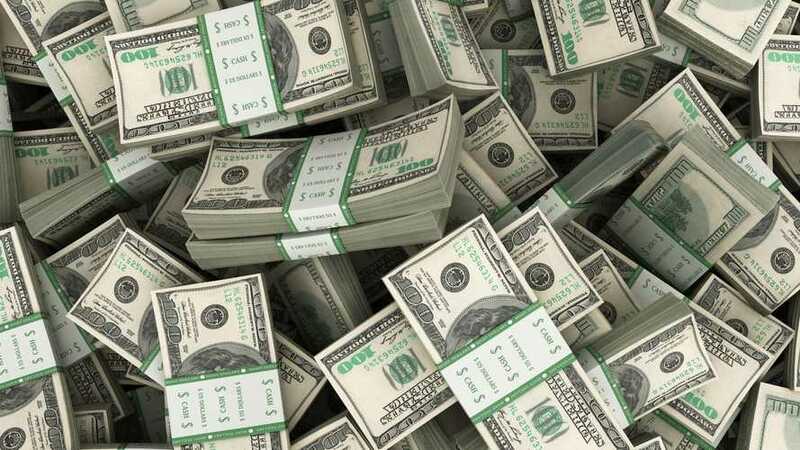 You guys know what's awesome? Motorcycles. You know what else is awesome? Cartoons. 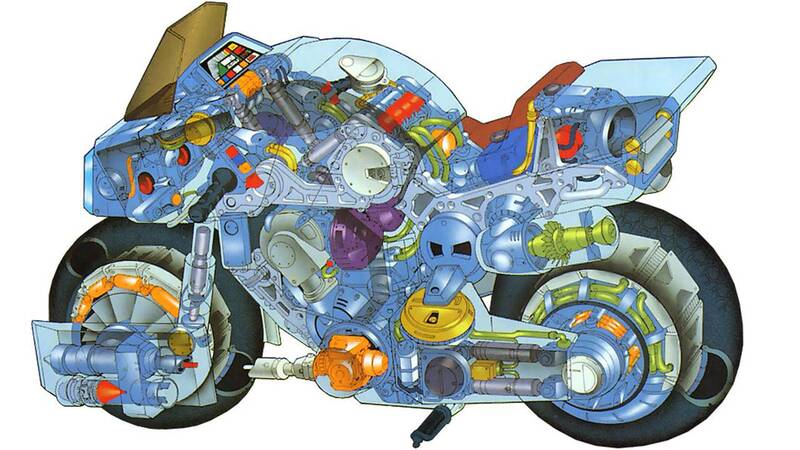 It stands to reason then that cartoons about or featuring motorcycles are the awesomest. As a young nerd and budding gearhead in the 80s and early-90s, I grew up watching, reading, and playing fantastic depictions of motorcycles in my media. 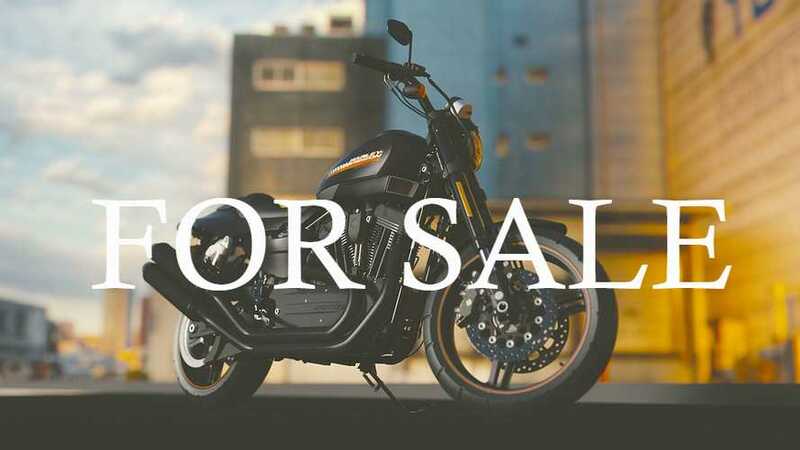 Those were the high days of both cartoons as ads for toy lines and the prime time supervehicle show, and I was surrounded by futuristic motorcycles everywhere I looked. It was, in fact, a golden age. Today—because I like bikes and cartoons and arguments—I'm going to outline what are, in my opinion, five of the best bikes ever captured on celluloid and one honorable mention.